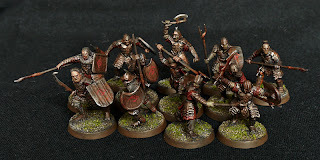 My four point viking warband, with hand painted shields, completed in less than a month. That's not a bad result, though apart from the shields, I can't say I enjoyed painting it that much. It was the poor sculpts that made it a chore, though en masse they look quite decent. I am not used to such mediocre models in my hands. I would not recommend the Gripping Beast starter warband as a product, but would suggest you look elsewhere. There are a few Foundry vikings in the mix and they are more dynamic models, though a little more chunky in build. At some time in the new year I will try the Drabant miniatures, which I first mentioned in this post. I have already detailed my choice of the clothing palette (in this post). For the shields I googled lots of designs and used some of them as inspiration, sticking to a limited palette of mainly red and white, with black and yellow as secondary colours. I also looked at viking jewellery, a couple of the shields have knots and beasts from images of pendants, one even from my wedding ring. The shields have really transformed the warband for me, I will definitely be enlarging it to six points in the new year. Until then, here's a few close ups of each of the four points. 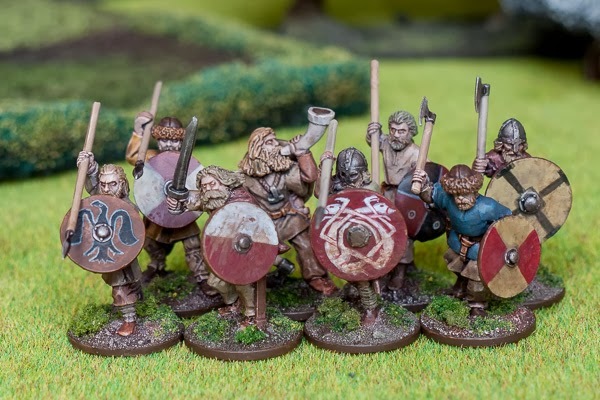 Just a very quick update to show that the viking warband is almost completely painted. It has already been in action a couple of times over the xmas break, which was the reason for rushing them through in the past month. Just the shields to complete on the last few and they are completely finished. 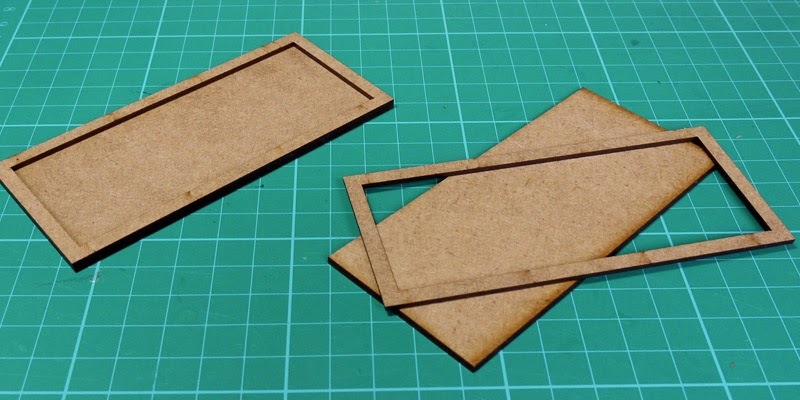 In this photo they are packed tightly on to a piece of magnetic paper, which roughly shows how they would look in a conventional wargaming movement tray. This is the first two points of my Saga vikings warband, fully painted. I stuck to a desaturated palette for the clothing, hoping that the shields bring them alive. Those on the left are the bondi, the basic troops available to the warlord. They are armed with spears and shields for the most part, with little or no armour. The four figures on the right are the hirdmen, the warlord's best fighting troops, with armour, swords and helmets and better decorated shields. All the shields are freehand designs, from simple quarters to stylised birds, serpents and a quite ambitious knotted dragon (second from right). 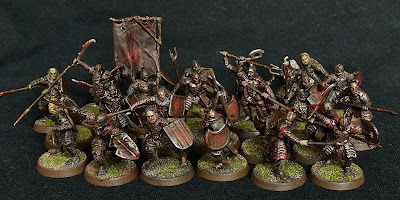 While this approach is more time-consuming than transfers, I do get a little "decal fatigue" when browsing images on the web and wanted to have a unique look to my own warband. They are not quite as polished as they could be, but for wargaming figures they are good enough. 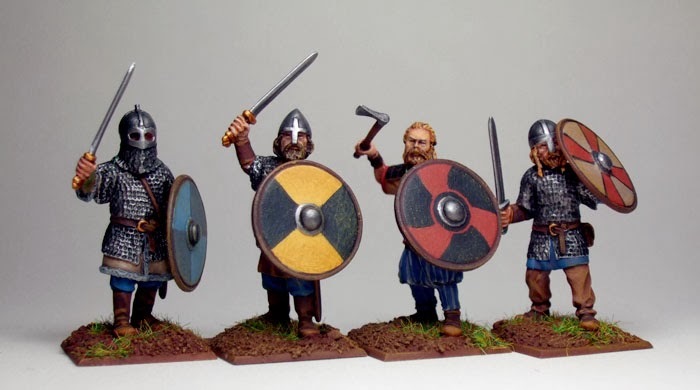 If you have been following my posts on the Saga viking warband, you may have noticed that I have been a little curmudgeonly about the figures I have. I spent about a year looking at what the market had to offer and was a little surprised that the range by the historical manufacturers was less than inspiring. After all, vikings are an iconic part of European dark age history, so you would expect there to be plenty to entice the gamer. I looked at Foundry, but find them a little chunky and leaning towards fantasy style. 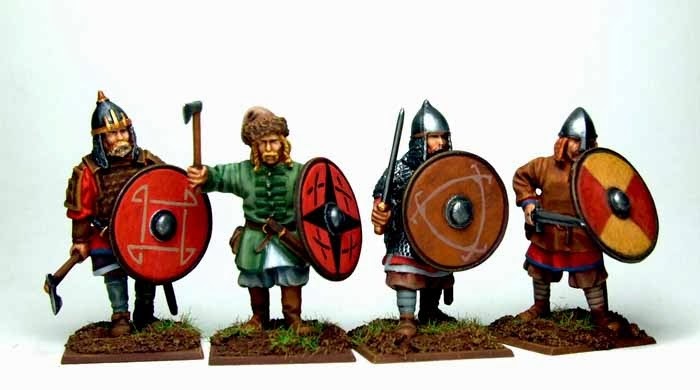 Gripping Beast are more historically accurate but fairly stolid, their range has barely been updated in twenty years (though the newer Jomsvikings look much better). There are a couple more smaller metal ranges which fall somewhere between these two. 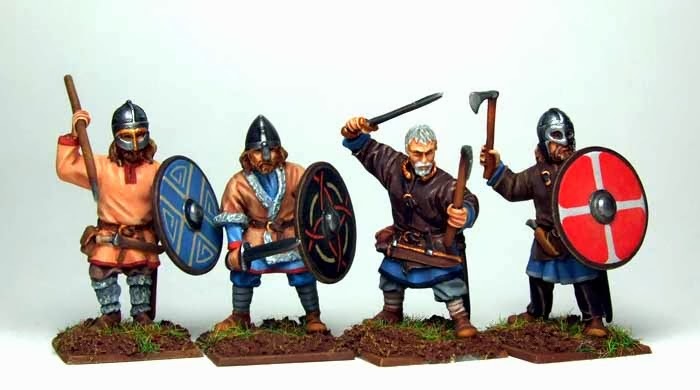 And then there are plastics by both Wargames Factory and Gripping Beast. I have held these in my hand, seen them up close. They are okay, not up to the standards expected by fantasy players, but cheaper than metals and so a possible starting point. 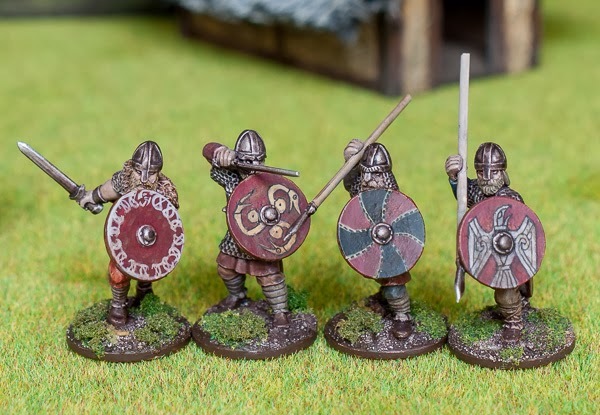 In the end, after dithering for months, I went with the Gripping Beast viking starter set, mostly because I managed to get a deal with a rulebook and dice thrown in, hoping that I could make them decent enough with some nice shields. The good news is that I have finally found what I was looking for. 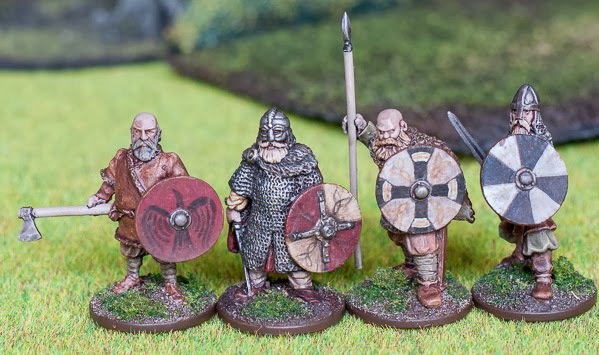 A very nice set of viking sculpts, leaning towards historical accuracy rather than fantasy looking, with good proportions and some dynamic poses. And with hands that actually grip their weapons. 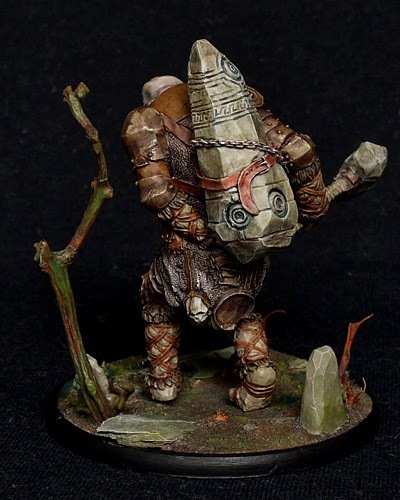 Drabant Miniatures is a Russian company with a small but very nice looking range of vikings. The UK supplier of the range seems to be Old Glory. My favourite set is those shown at top, but I would be very happy to include the others in my warband too. These three packs would make a unit of hirdmen and a unit of bondi, taking my starter warband up to six points. Something to look forward to in the new year I think. With the first half of the four point Saga warband well underway, I thought I would make a start on the remainder. 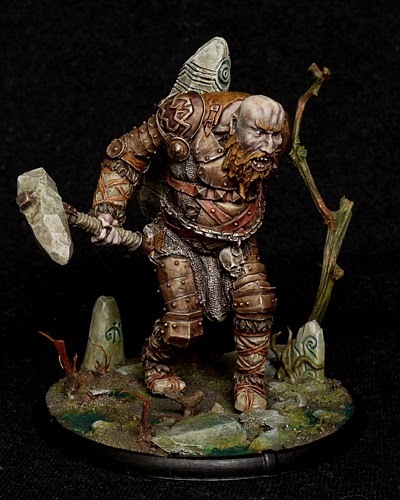 As I mentioned earlier, the warband is based on the Gripping Beast 4 point starter deal. 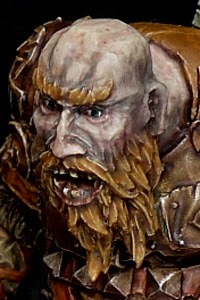 I had my doubts about the berserker models from the pictures online; in the flesh they are pretty disappointing and I have decided to sideline them for the time being. This left a hole in the collection and I needed four substitutes. Luckily, I have the remnants of my very first viking force and was able to recruit some of them. This force was my first foray into historicals, many years ago. See if you can spot them in the photo, though no prizes for guessing that one of them is front rank, 2nd left. The warlord is front centre, on the bigger base. Either side of him are a second unit of 4 hirdmen, while the remaining 8 figures are more bondi. I quite like the hirdmen, the non-gripping hands I can just about tolerate as long as the figure has a bit of character. The bondi are less good, I have to say I would probably not recommend the starter set to other gamers, the quality of the sculpts and figure poses are mediocre. The annoying hands can be remedied if you have some plastic bits, ironically I used Gripping Beast plastic Saxon bits. All is not lost, these figures form a reasonable basis for a warband, and I have recently discovered some excellent figures to add to them. More on that in a future post. After priming white, I set about getting the boring bits done first. Shoes, belts, pouches are all painted in orange-brown or darker brown, the two shades of leather most seen on any pictures I have looked at. I also painted the backs of the shields in these colours, to act as wood. Then I painted on the socks/garters and trousers and a few bits of clothing in natural colours, to simulate undyed wool. All these areas were then glazed with browns and greys to add some shade and texture. The clothing was painted in a range of fairly desaturated colours. For most of these I toned down the intensity of the original paint colour by adding a pale colour such as grey or even white. I also used less vivid versions of some tones, for example instead of red I used chestnut. I kept the richer tones mostly for the more elite warriors, just a few bondi have any colour of note. These areas were then glazed with darker shades of the base colour. Finally, the armour and other metal areas were given a base coat of chainmail. 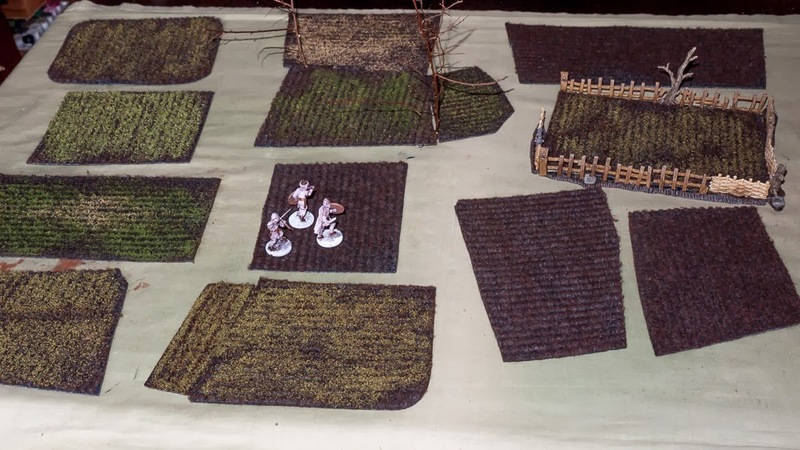 I made these fields with Saga games in mind, but they could be used in any historical setting and maybe even in fantasy scenarios. They were simplicity itself to construct, made from a very cheap door mat, the cheaper (and thus thinner) the better. If you live in the UK and have a Wilkinsons nearby, a single mat will cost you the grand sum of 88p. A brown mat would be ideal, but I had to buy a grey one, it was either that or blue. The mat has a backing of rubber/felt and is easy to cut into smaller sections with scissors. Then I quickly added some brown, cheap craft paints from my "terrain box" - full of bottles of discounted acrylic paints I use on most of my scenery. Freshly ploughed field done. Yes, the furrows are precise and straight, unlikely in the dark ages. And yes, the unplanted fields do just look like bits of carpet when viewed like this, but you have to imagine them with hedges, huts and maybe a few cattle roaming around. Some of the fields I painted over the tops of the furrows with pva glue and then sprinkled with various colours of flock, to represent different crops. It's obviously early spring and they are just sprouting, or late autumn and they are freshly cut. When I turned over the mats and tapped off the excess, the flock stuck in the depressions, possibly because the paint was still tacky or maybe it just gets lodged in the fibres. The simple solution I found was to use the stick end of the brush to run down in the deeper areas, to remove most of the excess. One nice side effect of this process is that some of the fibres stand up and with the flock look like tiny plants, a bit too tiny for my camera to capture but you can see that they make a pretty decent impression of crops in fields. One door mat made all these fields, enough to sustain a small hamlet I reckon. There's certainly more than enough here for a typical game of Saga. Now I just have to make a few hedges and other boundary markers to give them a little more polish. This is my complete collection of wooden boundary markers from my Warhammer collection, I need lots more so another cheap solution is required. I have an idea involving another door mat, hopefully that will yield results in the near future. Before I get started on painting the vikings I had a little browse around, to see if I could find any information on viking clothing. There's very little specific historical evidence, but there are plenty of re-enactor sites to peruse. 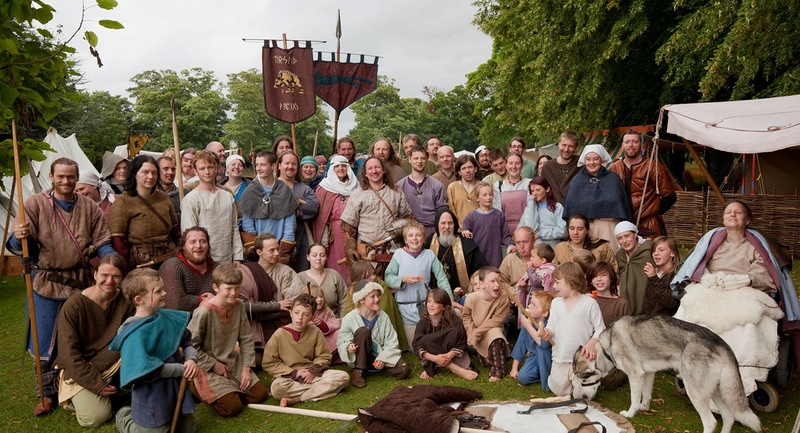 These people spend their weekends dressing as vikings, saxons, etc., in medieval camps and events. There is a surprising amount of research and authenticity applied, so if you like your figures to have a dash of realism, then they are a good source of inspiration. You might think that they look a dowdy bunch, but the photo is probably taken under a typical English sky and so not quite as bright as it might be! There are certainly plenty of browns and tans, creams and pale colours. But there is also a surprising range of other colours. 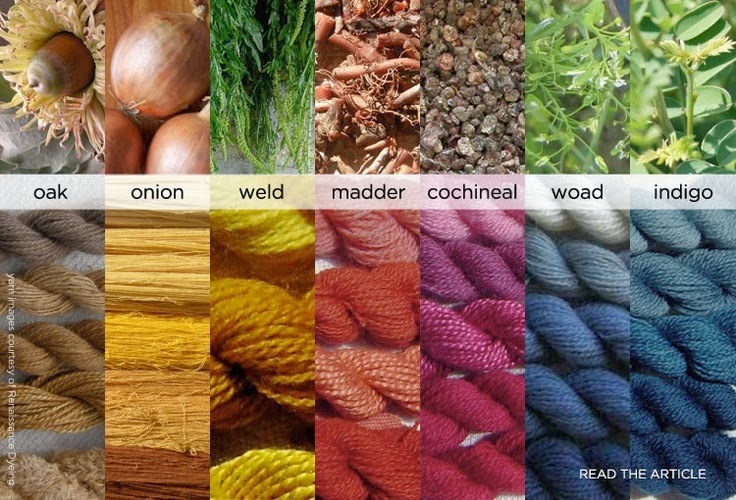 If you are really interested, you can even find recipes to make dyes for yourself. I remember talking to a re-enactor at one event in York, England, about his clothing. He was wearing a lot of brown leather and fur, but also a pale red, almost pink cloak. He explained that it had been made using natural dyes and that the colour faded quite a lot. There's no real evidence to suggest that vikings liked red (as they are often depicted in films and books), but even if it were historically accurate, it would quickly fade to a dusky pink. The most important point I learned was that the colours are subdued, desaturated. So I will be keeping the clothing fairly low key, particularly for the bondi (and even more so for the levie if I ever collect them). In any case, the main focal point of the figures is the shields, so keeping the clothing fairly unexciting will act as a good plain backdrop for the prominent shields. 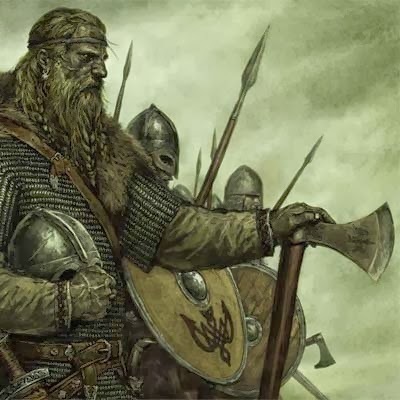 The first day of the month of the vikings! The prep work on the first half of the warband is now done. 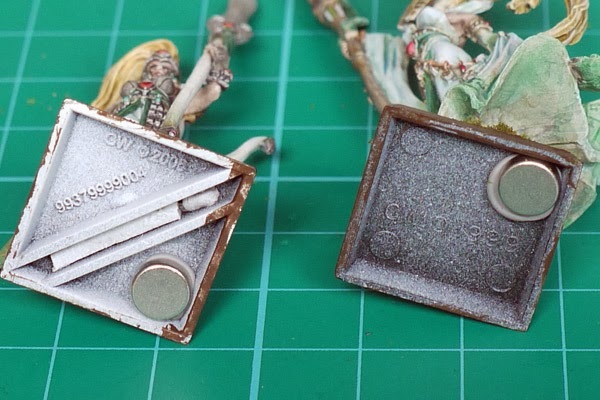 I really don't understand why gamers prefer metals, removing the mould lines with files is far more tedious than scraping away plastic models with a knife. There's very little opportunity to repose too. I had major problems with the hands on these figures, they are more hooks or claws and just would not grip the weapons properly (and don't get me started on those bendy spears). In the end, I chopped a few hands off and replaced them with plastic bits from my Saxon thegns box, to finally achieve a reasonable pose. They are based on pennies (which are usefully magnetic) and then a couple of layers of a sand and glue mix applied to hide the tabs. Now that they are at this stage I do appreciate the heft of the model in hand, much nicer than a plastic figure. On balance, I prefer the ease and flexibility of assembly that plastics give, but I can understand why some gamers prefer the old metals. I actually wrote a draft of this blog post about a year ago. 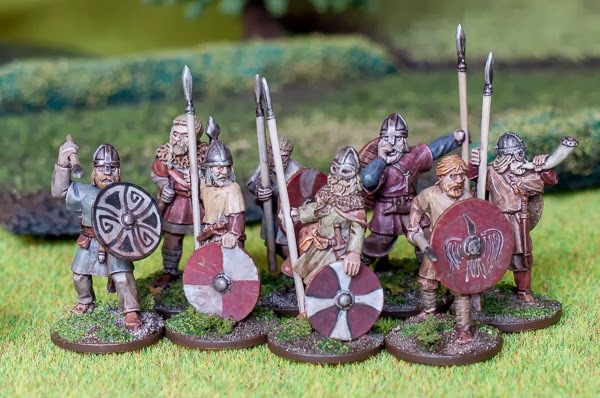 I had just finished painting Anglo-Saxons, my first Saga warband, and was eager to get them a foe to fight against, which just had to be vikings. I love viking history and Scandanavian mythology so it was inevitable I would collect them at some stage. I looked around at all the figures available and came to a juddering halt. I found that the sculpts available to buy were fairly bland. 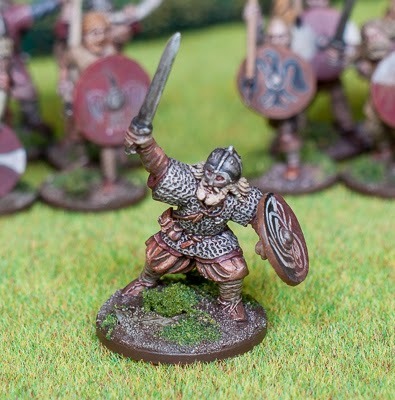 Maybe I have got used to the high quality and variety available to fantasy gamers, but the offerings from the historical mini companies seemed mediocre. So I put them on hold, hoping to find a decent range at some time in the future. 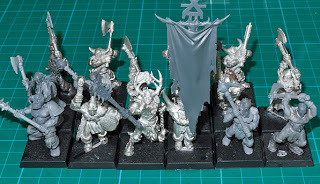 Fast forward to the present and I have finally decided to go with the Gripping Beast starter warband, partly because I was able to pick it up at a slightly reduced price on a forum, mostly because I realised there was not going to be an alternative appearing any time soon. The figures are okay sculpts, a bit "wooden" in the way that historical metals often are, but they are about the best I can find. I have a few figures in my collection that are worse sculpts, but so many more that are much, much better. And yet, they are highly regarded on historical gaming forums, so I guess it's just a different standard among different genres. The starter warband contains 16 bondi, 4 hirdmen, 4 berserkers and a warlord. I have decided to split them into two batches, starting with half the bondi and the hirdmen. The berserkers are strange creatures (one of them is stark naked!) and I might replace them. I do have a handful of vikings from years back when I first dabbled in historicals, so they might be called out of retirement. Of course, though they are well over 10 years old, they fit perfectly with the newer figures. I am hoping to get the first batch primed over the weekend. 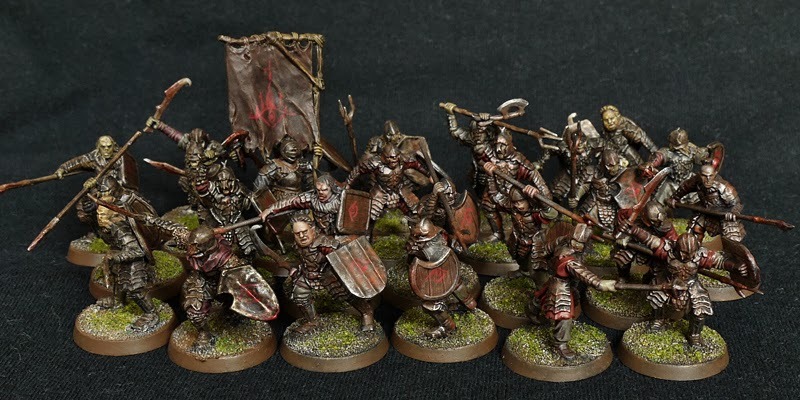 I want the whole warband painted in time for xmas, they are pretty simple figures so should paint up quickly. I was in Manchester last weekend and decided to nip into the GW shop. It's been a long while since I ventured into one, I mostly buy my supplies online. I wanted a unit of flesh hounds for a customer, independent online shops do not stock finecast, so I thought I would pick up a box from the bricks and mortar shop, save the wait for the postman. "Er, we don't stock them, you have to order them online", said the GW guy. Oh well, it was not a completely wasted trip as the window and cabinet display was very good - too many shops have rather mediocre painted figures, but Manchester is not one of them. 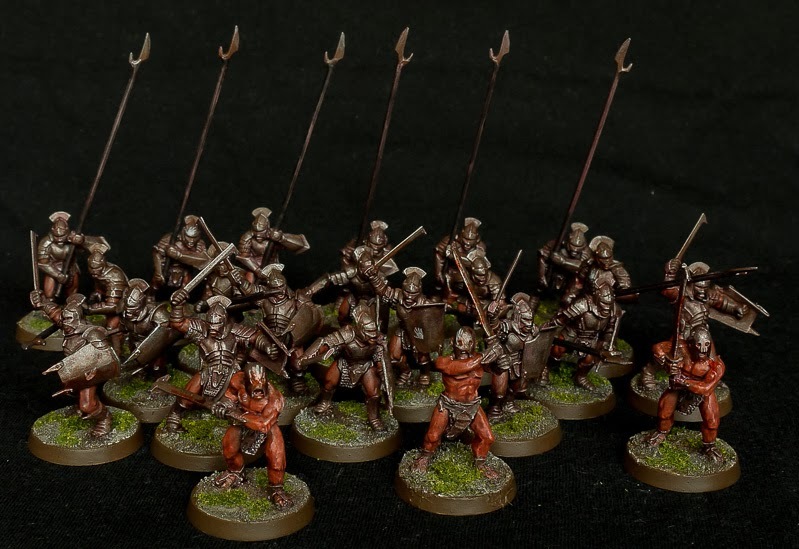 I was particularly drawn to the Lord of the Rings armies, a huge horde of uruk-hai in particular. 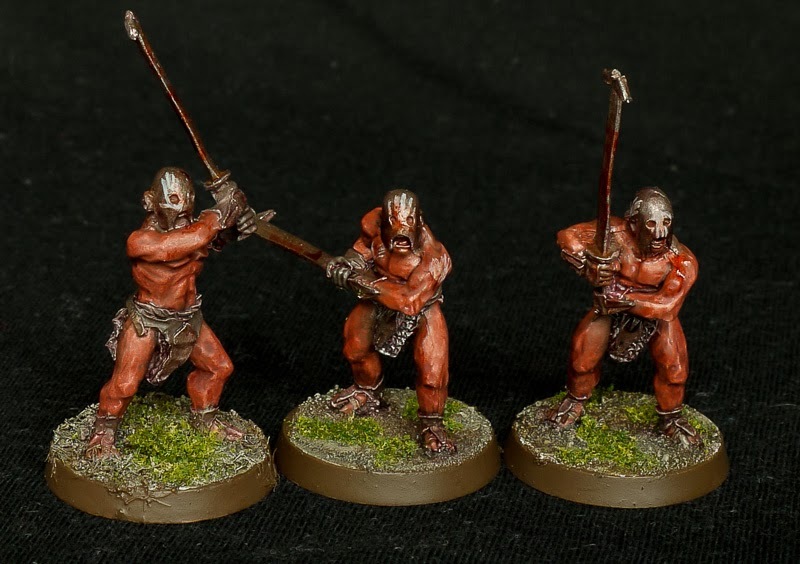 Meanwhile, in the short version of the intro, I painted up some uruk-hai this week. 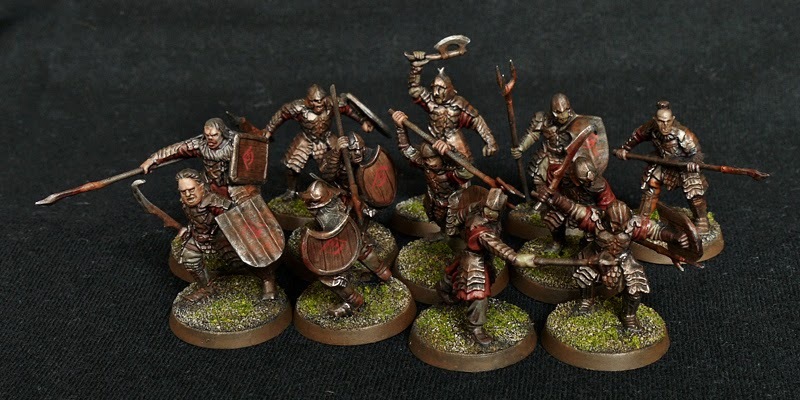 These models are one set of plastic fighting uruk hai and a trio of metal berserkers. As usual with my LotR figures I have speed painted them, just a few white hand markings being the only bits requiring any finesse. Isengard orcs are elite troops and so this little mob is already at 250 points or so. When I add in some wolf riders and maybe some orc allies from my Mordor contingent, it will be a complete army. Having finished the whole lot in four or five sessions, it would have been nice to continue with this army for a while, but I have something else I want to get done by xmas. Hopefully I will get back to them soon in the new year. 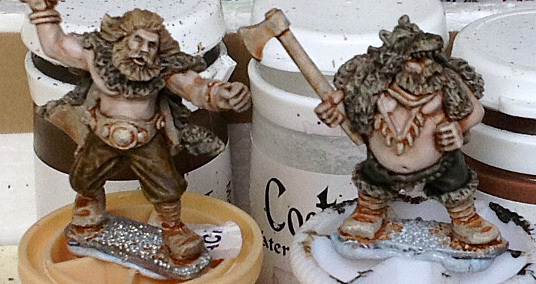 At some point I will be painting vikings for Saga, not to mention RedBox dwarfs. I want to develop a new way to paint the skin, so I dug out a couple of Foundry figures with plenty of areas to practise on. I primed them white using vallejo surface primer, just brushing it on then blasting it dry with a hairdryer. Then I washed over the figures with a brown colour, to help me see where all the details are (or not in some cases). 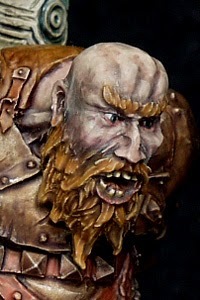 I want to see what I can achieve by just glazing on the colours. I started with beige brown (all colours are by coat d'arms) for the shadows, then added a little white for the highlights. This was a little too pink for my liking, so I added a tiny amount of olive to remove some of the orange from the tones. It's quite hard to tell the results from the picture, but it's very smooth and quite easy to apply. It's possibly a little too pink, but then these are Scandanavian vikings and we can assume it is midwinter! Painting work is progressing on the Khorne marauders. Most of the neutral colours are now completed, the lack of red will be rectified in the next painting session. As I was completing assembly I was searching through my bits for some Khorne icons to use on the banner. Alas, my search was fruitless and I will have to rely on my freehand ability, which is nerve-wracking. However, I did find a Reaper model of a viking that I am using as the unit champion. The previous unit champion has now been promoted to a hero, though strictly he is called an exalted champion! Chaotic nomenclature at it's finest. 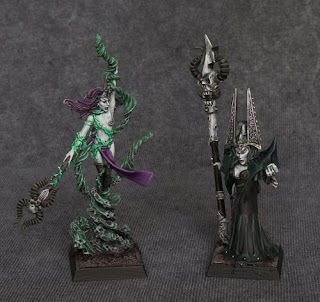 I was hoping to have some vampire counts painted up for halloween, but the end of the month has come around already and I only have these two ladies to show. They are metal figures sourced from ebay, I have painted them up to put back on auction to raise funds for more toys. They are also my entry into the warhammer forum painting competition Slaves to Darkness. If you want to see more pictures, maybe even place a bid to help an impoverished painter, then here's my ebay link. I have not done much with my chaos warriors for a good while. I played a couple of games last christmas and added a painted character or two since then. It was actually in July of last year that I started building this unit of Khorne marauders, then got distracted. Well, now I am picking it up again. Most of the unit is built, I just have some weapon swaps on the metal rear rankers and two more to clean up. I originally wanted to replace all the metal heads too, the newer plastic marauder heads have so much more character. But these days I cannot be bothered spending too much time on the third rank and beyond - they are practically invisible in the mass of a regiment and anyway nine times out of ten are removed within three turns. So the old slightly goofy horned heads will remain. Hopefully I can stick with this unit to completion. I have had a hard time generating enthusiasm for my warhammer armies in the recent past, but with the shorter daylight hours and long winter months ahead, I usually up my productivity levels. I also have a Khorne character half painted that I should be able to complete along with this unit. Dark Ages buildings are pretty easy to build or collect. 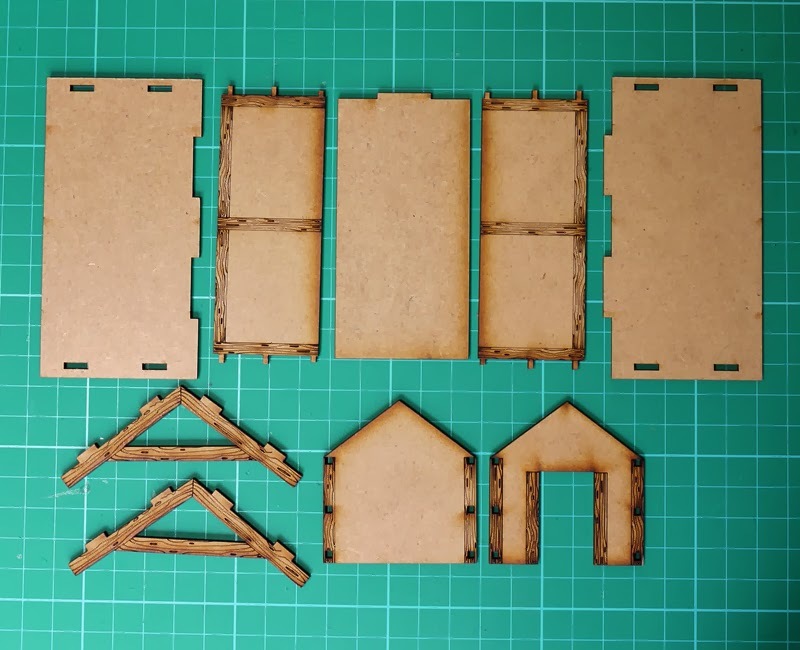 I made one from foamboard and cardboard (shown here) and you can find plans for buildings knocking about on the web. Or you can buy them from several online stores, with lots of options including printed paper downloads, mdf kits, resin kits and even pre-painted versions. There's something to suit every pocket and they can be used in a variety of games, from Saga to Warhammer and probably lots of others in between. I recently added to my collection with a couple of purchases from warbases. I picked up a timber barn and a viking longhouse for the princely sum of seven english pounds. The barn is the most elaborate in terms of mdf laser etched timber bits. It comes in a kit form, there are no instructions included but, as you can see, it's a pretty straight forward jigsaw puzzle. I did a quick dry run and found that the building holds together with no glue! That's good solid engineering. 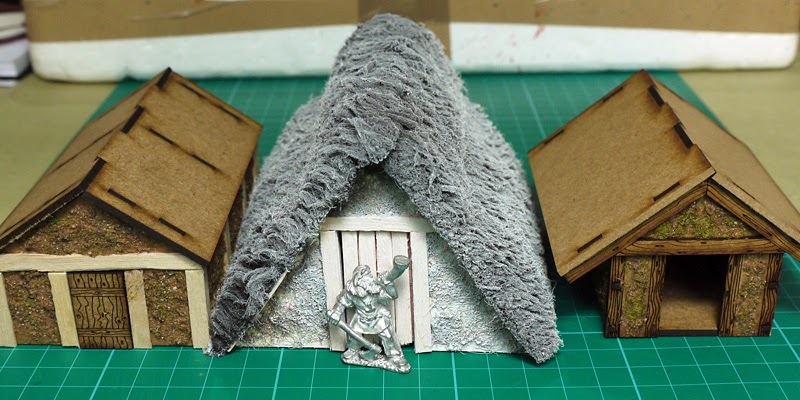 The viking longhouse came in a similar kit but with less details etched on and did require glue to hold it together. In any event, I glued both buildings together and set them aside to dry. It took me about five minutes per building, clearly not designed by Ikea. The next step was to add a little texture. To the viking longhouse I added some basic timber detail in the shape of wooden coffee stirrers, ideal in size and width as you can see in the picture. Both builidngs also received a texture coating to represent a rough render (as in wattle and daub). This was a mix of diluted pva glue, sand and static grass. I just smeared it on to the walls with a coffeee stirrer. While it was drying, the local building inspector came round to size it up. All in all, I was pretty happy with my purchase. The timber barn, with pre-etched detail, was quickest to assemble . The longhouse was quick too, adding timber framework extended the build time but I thought it was worth the extra effort. My original "grub hut" turned out to be a bit on the large side, but no matter, perhaps it's owned by a particularly wealthy Saxon family. 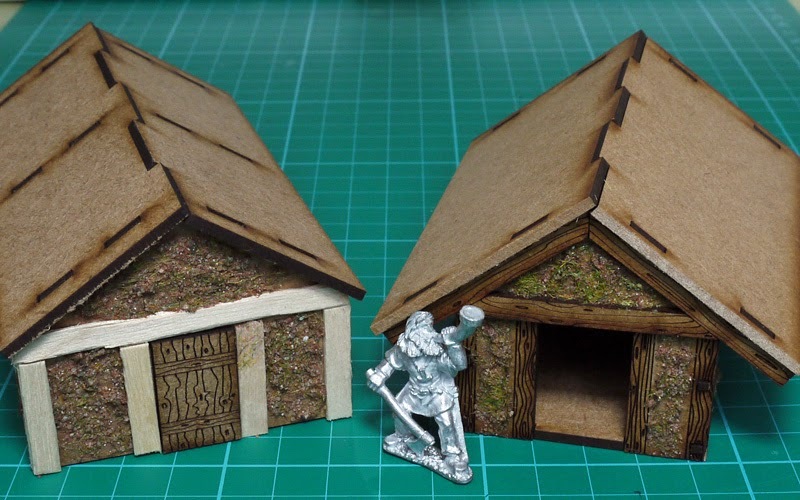 When the thatched roofs are added and all the painting is done, the buildings work together much better. I painted the walls in an earth/yellow colour and the thatch roofs in a grey - if you google thatched cottage you will see that the colour is nearer to grey than the fresh yellow of newly cut straw. Working from brown fur was a pain, I would shop around for a grey/tan fur for future projects. It's also a little bit too shaggy in bits, but overall I am quite pleased. Looking at them here I think they would also work well in a winter setting, they have that dusting of snow appearance. Quite fitting for a viking settlement I reckon. 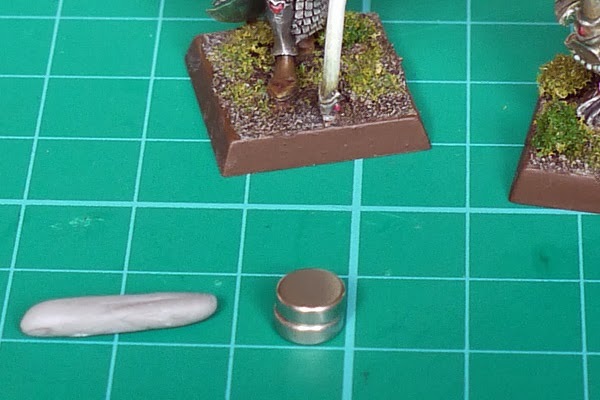 Following on from the post about how to make a magnetised movement tray, here's how to magnetise your models with a quick and easy method. You need some rare earth magnets and some modelling putty, such as green stuff or (as here) grey stuff. Both of these are readily available in online stores and ebay. Magnets are 6mm x 2mm. Grey stuff rolled up and ready. 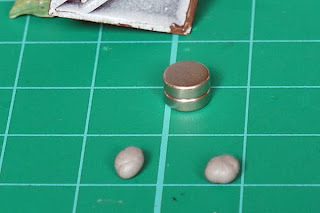 Make a small putty ball for each magnet. Press putty ball on to underside of base. Press magnet on to putty ball. Hopefully that is all self-explanatory. 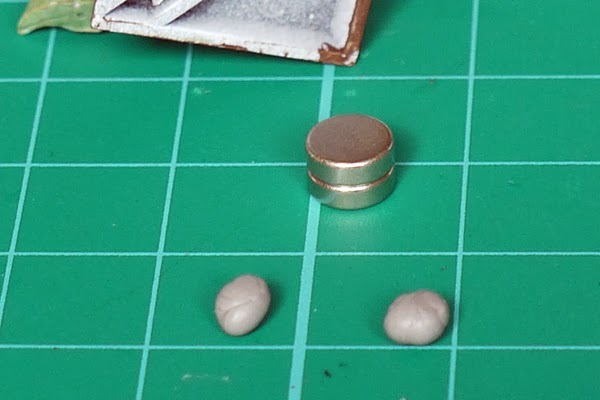 The magnet is fixed to the base by the putty. 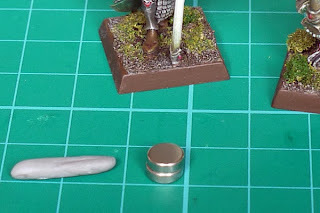 To ensure the magnet is flush with the ground, place it loosely on the putty ball. Turn the figure right way up and gently press it down on to your cutting board (or any other non-magnetic flat surface). The magnet will squish up into the putty, ensuring it is a) stuck to the base and b) perfectly flat and flush with the ground. When the putty is set, the figure can be placed into the tray. Very light figures such as these and plastics will hold pretty well with these small magnets. Cavalry figures might need two to hold. Metal figures are a little heavier and might need two or more. Bigger magnets might be needed for really heavy figures, but do bear in mind that the depth of 2mm is about right for a standard slottabase. Anything deeper than this will be deeper than the recess under the base and thus it will not be possible to stand flush with the ground. I used to make my own movement trays, from plasticard and spare plastic sprue. It's quite cheap, a bit time consuming with all the measuring and cutting, but easy enough. 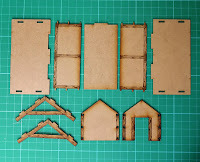 Nowadays, I have an easier method, using pre-measured and laser-cut mdf bases. 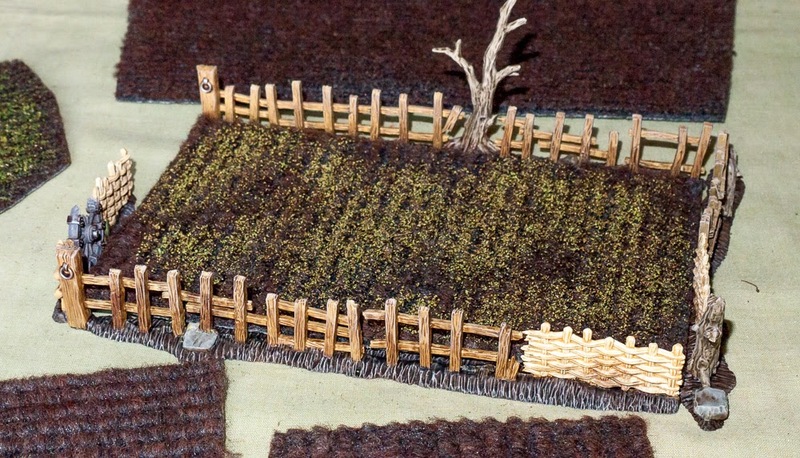 These can be bought from a variety of suppliers, my preferred is warbases.co.uk. The movement tray is usually bought as one piece, with the top and bottom glued together (shown left), but you can ask them to leave the pieces separate, as shown right. In order to make the base magnetic, there's a number of things you could do. One thing that some do is apply magnetic paint to the base - of course doing this would mean you could buy the whole thing pre-assembled. 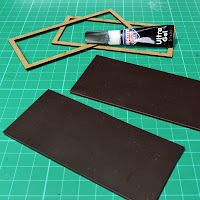 I have never tried magnetic paint so cannot comment on the practicality, but it's probably the easiest method. My tried and tested course of action is to put a sheet of magnetic vinyl on the base. You can buy this on ebay. 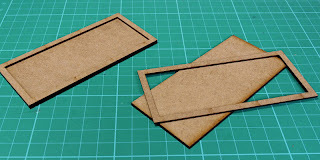 It cuts to size with standard scissors and glues on with superglue - or you can actually buy it with an adhesive backing. 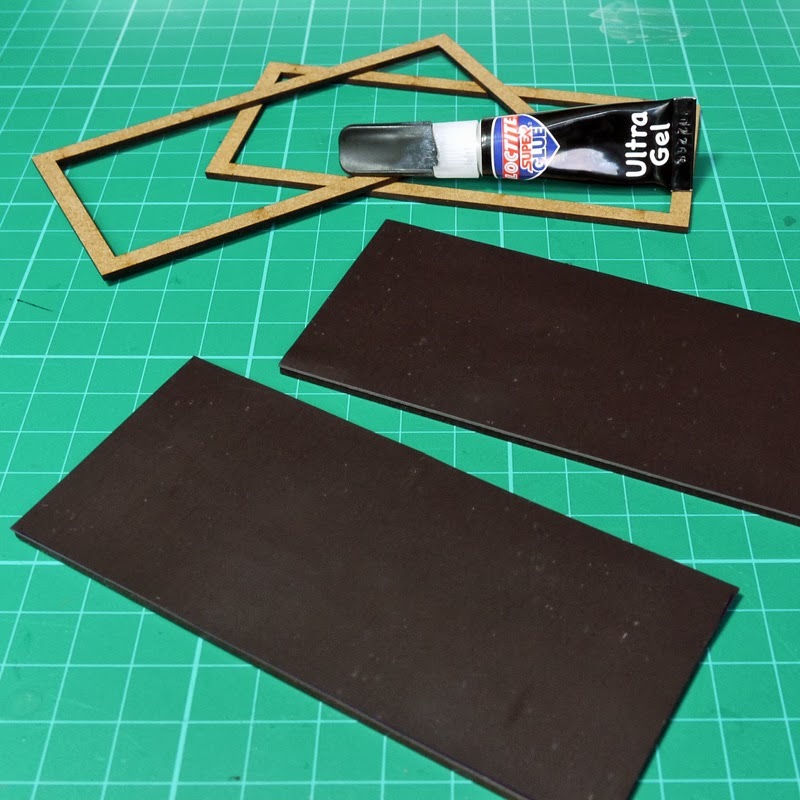 Whichever you do, it's easy to measure out, just draw round the mdf base itself for a pretty close fit, glue it on, then trim any overhang with a craft knife. The final stage is to glue on the top section. Again, I use superglue to do this. Job done! 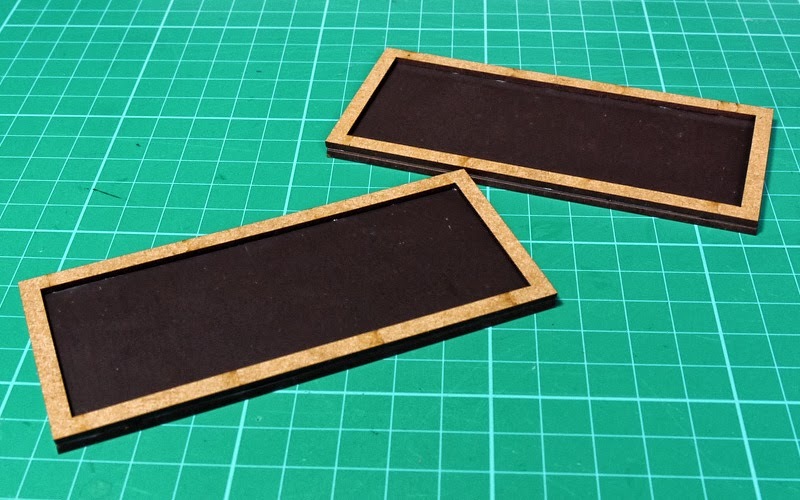 Easy magnetic bases, with no measuring, just a little trimming and glueing required. The next stage is to add some scenic decoration, sand and rocks, static grass, to match your bases. Be sure to check out the accompanying post - How to magnetise your bases. 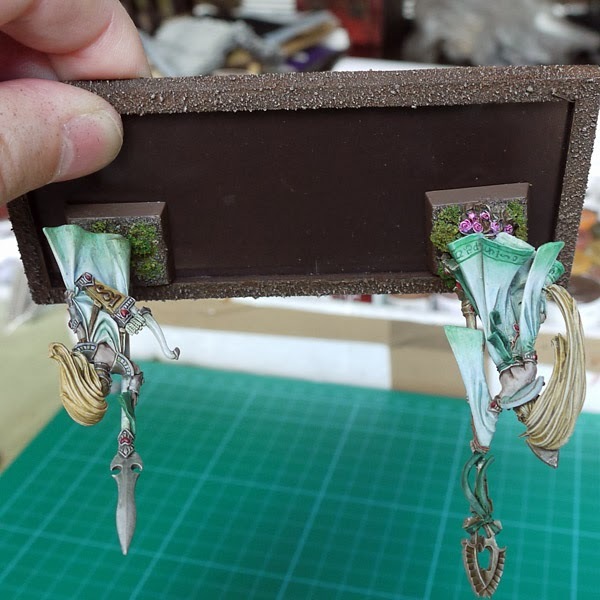 I have been commission painting a lot of intricate models of late - high elves, dark eldar, lots of fiddly little details that seem to take forever to get done. When it came to the weekend and time to paint my own models, I really wanted to blast through something in one or two sessions. A dozen Morannon orcs fitted the bill perfectly. 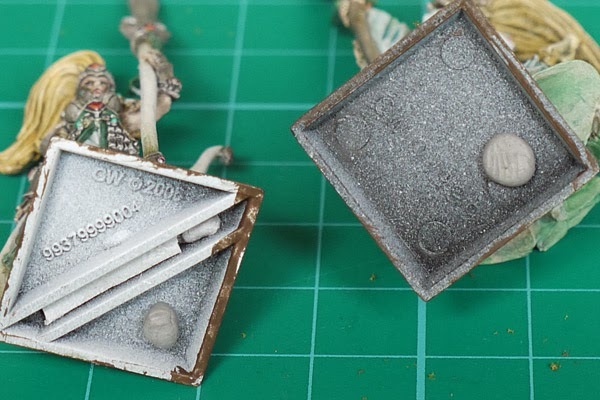 These figures were primed black, then drybrushed roughly with two different metal colours. Then I quickly picked out the non-metal areas of cloth and skin. Everything was then washed with various hues - browns, reds, blacks, etc, depending on the underlying colour. I used MIG pigments to add some rough and ready rust effects. Finally, I added a rough shield icon and based them. In all, about 4 or 5 hours work. The morannon orc contingent now contains 26 figures and that's my supply of them exhausted. I have more Mordor orcs I could paint, or more likely I will turn to some wolf riders. The Mordor army is now about 600 - 700 points strong. I had a couple of queries about a tutorial on painting ghouls. I did prepare one a few months back but for some reason I did not post it. Well, that's remedied now. 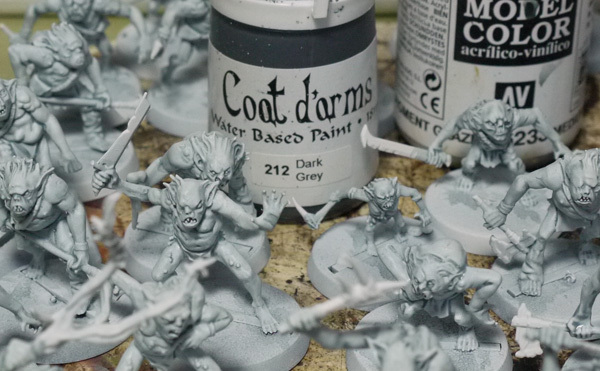 Here's my quick and easy way to paint your ghouls. Step 1: Clean and assemble figures. I put the figures into the slottabases for this stage, they are a snug fit so no glue is required. Note that I am using these as temporary bases, for traditional gaming they would be glued into square bases. They are primed white. Step 2: I mixed up a thin glaze of dark grey paint, with a few drops of matt varnish and a few drops of matt medium added. I find this helps the coat to glaze smoothly and also stick in the recesses, without too much pooling. I don't measure exact quantities, but it's roughly equal parts of the three mediums, then enough water to make it translucent on a white plate. The usual description of skimmed milk is about right. Step 3: Another glaze is mixed up, this time using equal amounts (roughly) of dark grey and chestnut. This is applied more densely to the mouths and the eye rims, less densely as shading on the bodies and limbs. The aim is to accentuate the facial features and also to hint at a mottled skin. On some of the models I dotted on the colour to make patterns on the head or upped body, again to add a little texture to the skin. Step 4: Time for some standard painting now, I just apply these bits neatly as possible. The hair gets a coat of field grey, then I mix in some tan earth to paint some of the loincloths. I then mixed in some horse tone roan for the remaining loincloths. Bones are painted off-white, straps are painted horse tone roan, metals are painted chainmail. Step 5: All the bits painted in the previous step get a glaze of a darker colour to provide some easy shading. The bones and strapping are glazed with a mid-brown, the loincloths with a light brown or green, depending on the original colour. The hair is glazed black, then chestnut added to make a rusty brown to glaze the metals. Finally, a very light grey wash over the feet gives a hint of a dirty environment. At this point, the figures could be based and used in games, but I want to add some dirt, rust, blood and the like. Step 6: For the rust I use MIG pigments, added to an old brown wash with a few drops of matt varnish. I use dark mud and standard rust, mix a little puddle of each on my palette, then mix the two together for an intermediary shade. Then I stipple these onto the weapons, starting with the darker tone, then the mid, then the lightest, adding less of each as I progress through the stages. I then mixed some MIG russian earth with a purple ink and some matt varnish, to create a dark greyish wash to add to the arms and legs and on any areas of cloth. This gives a little more definition and shading to the figures. Finally, I add the blood, which is made from Tamiya red, some mixed in with the grey wash. It's all a bit rushed and random, I add it mostly to the hands and mouths, dot a bit here and there. Done! There's still the bases to do, mine are on large element bases but for most it would be a simple task now to base up in the usual way with sand, grass, flock and whatever works for you.